Who would have ever thought that Campbell's® Tomato Soup could lead to spice cake? This classic recipe will surprise you and keep your patrons asking for more. all-purpose flour	 61 oz. 3 1/4 qt. egg, large, well beaten	 12 ea. 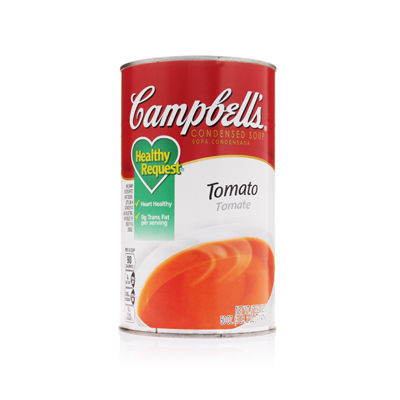 Campbell's(R) Healthy Request(R) condensed Tomato soup offers the rich traditional flavor of tomato soup with a more nutritious profile. 1.Mix flour, baking powder, baking soda, nutmeg, cinnamon and cloves. Set aside. 2.Beat shortening with mixer at medium speed for 5 minutes. 3.Gradually add sugar and beat 5 minutes more or until light and fluffy. Scrape sides of bowl frequently. 4.Add eggs. Beat 2 minutes more. 5.Add soup and flour mixture alternately, mixing until smooth. 6.Divide batter evenly between 2 greased and floured sheet pans (18” x 26”). 7.Bake at 350°F. for 35 minutes or until done. 8. Frost with Cream Cheese Frosting.